An overview of the most important characteristics of foam insulation. Polyurethane foam is a thermal insulator that can be applied for hot, cold and cryogenic insulation. With a declared Lambda value around 0.030 W/mK (Rsi), spray insulation foam is among the very best insulating materials. On top of this, polyurethane sprayfoam is also exceptionally well suited with regard to all technical characteristics. The insulating qualities of a material are expressed in the Lambda value which reflects thermal conductivity in W/mK. The higher this value, the less well the material insulates. With a material that has a low Lambda value you therefore require less thickness to achieve the same result than with a material that has a higher Lamda value. In the selection of products, it is advisable to compare the Lambda value of the materials. The R value is the heat resistance of a material layer and is expressed in m²K/W. The greater the R value, the greater the resistance that is encountered by thermal transmittance and the better the material insulates. Material thickness in metres is divided by the Lambda value. The higher the value, the better the insulation, a layer twice as thick also has a thermal resistance that is twice as high. For example: An insulating material with a thickness of 10 cm (= 0.10 m) and Lambda value of 0.030 W/mK gives an R value of 3 m2K/W (0.10 / 0.030). 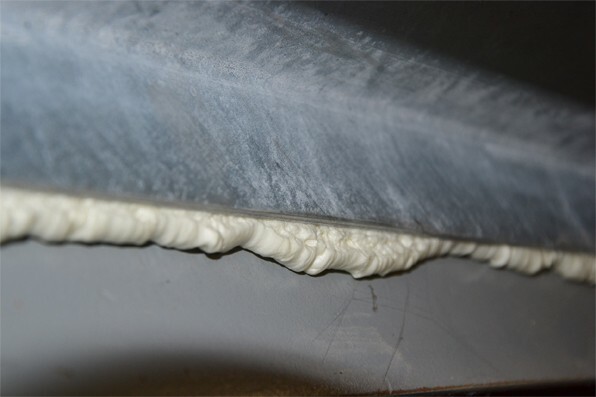 PU sprayfoam, with closed cellular structure, does not absorb any water and is not sensitive to mildew growth, this contrary to open-cell polyurethane foam. Closed cell polyurethane foam is well suited to all applications for which moisture must be avoided. A thin layer of 2 cm is already sufficient – in the majority of applications – to phase out condensation. 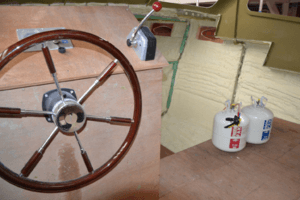 Polyurethane foam is among other things used in a large number of maritime applications, on the one hand to combat condensation and on the other to provide insulation. 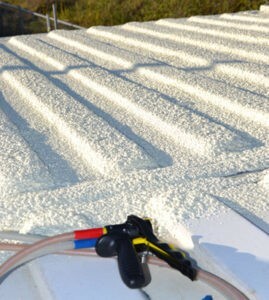 If the PUR foam is used as a means of providing resistance to condensation, then a 2 cm layer is sufficient. If the intention is to have insulation, a layer of 6-7 cm PU insulation is recommended. Depending on the required thickness of PUR foam, it is possible to choose from a wide range of different nozzles. The foam can be applied easily and the speed with which you move the spray gun defines the thickness of the PUR insulation layer. Not only does foam provide the perfect insulation. It also ensures that everything is seamlessly sealed off. 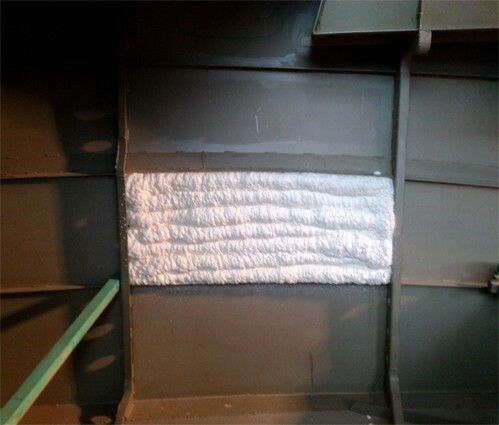 For example, with over 95% closed cells, FROTH-PAK PU foam is exceptionally well suited to maritime projects. By comparison to open-cell PU foams, this two-component foam does not absorb any moisture and forms the perfect watertight barrier. After the PU insulation foam has been put in place, after a few minutes you can either put a following layer in place or cut off the foam so that the surface can be occupied with a finish of your choice. Spray foam distinguishes itself through its continual flexibility. The Fomicom sprayfoams are two-component PU foams that are made up of [at least 95%] closed cells ensuring perfect airtightness. After all, good insulation is only as reliable as its weakest link. To rule out energy loss, everything must be perfectly sealed. The simple sprayfoam system allows the placing of seamless insulation in a controlled way whereby it is possible to dose as much as you want and waste is reduced to a minimum. To prevent draughts, cold and heat loss it is very important for the whole of the construction envelope to be well insulated and also 100% airtight. After all, good airtightness can raise the energy performance of a building, construction or industrial product by up to 15%. As a result of the closed cellular structure of the PU foam, moisture absorption and mould growth are also able to be avoided. Thanks to the low-flow nozzles, the PU insulation foam can be simply and precisely applied so that there is minimal loss and/or waste. By contrast to other PU foams, after only 5 minutes Fomicom sprayfoams are already fully cured and workable. The Fomicom low pressure polyurethane systems make it possible to apply PU insulation foam without aerosol formation. Working with the polyurethane foams require the regular safety measures such as safety goggles, A2P3 surgical mask, gloves and appropriate ventilation. Once it has cured, the PUR foam is inert. 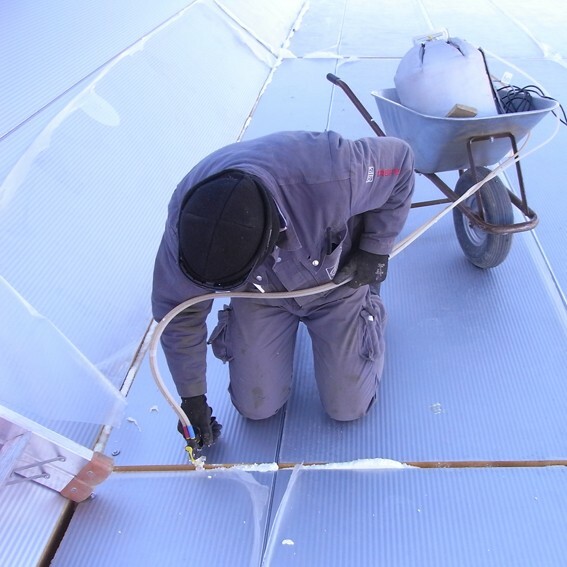 Our spray insulation foams comply with the Montreal Protocol of 1987. The products do not contain any formaldehyde or CFCs. Wood, metal, stone, plastic etc. Fomicom insulation foams can be applied to almost any type of subsoil. The only requirement is that the material is dry and dust-free. The polyurethane foam can be applied in a number of different layers, whereby a number of different layers are applied causing a close-knit insulation layer to be obtained that does not break away from the surface. Polyethylene (PE foil) and silicones are one of the few materials with no or limited adhesion. For this reason, very often moulds are made out of this material so that demoulding can take place and the PU foam presents a smooth finish. If however adhesion to such materials is required, it is recommended to treat the surface first using a primer. If the PU foam is applied to a material such as metal, aluminium or plastic and no adhesion is desired, the surface can be treated beforehand using a release agent. Fomicom sprayfoams are quick-setting PU foams that already take on their final shape after 60 seconds. These polyurethane foams expand to up to 3 times its sprayed volume. Cutting and processing is already possible after 5 minutes. In addition to ease of use, time savings are a major reason to choose this high performance semi-rigid foam. Decor pieces for theatre, film studios, museums, amusement parks and aquariums are often made using two-component PU foam. The polyurethane foam is used to fill cavities, increase structural strength, bond polystyrene blocks or simply create volume. In addition to ease of use, time savings are the main incentive here. After all, after 5 minutes the PU foam has fully cured and can be cut, painted or lacquered immediately. Creating large volumes using black pour nozzles.